Lake O Levels: Rural Residents Offer Input, But Is Anybody Listening? 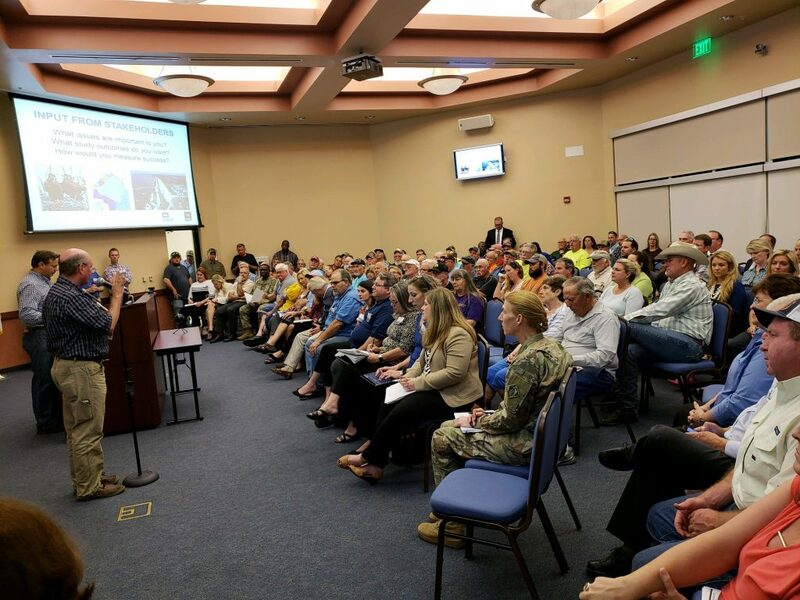 In one of a series of public meetings hosted by the U.S. Army Corps of Engineers this week and next, Okeechobee, FL residents last night packed the house for presentations and public input about the management of lake water levels. 200 people showing up for a meeting like this in Okeechobee is like 20,000 showing up on the coast, taking into consideration population density. It matters to them a LOT. Another meeting on the same topic is planned for Clewiston on Monday. Many of the public comments in Okeechobee targeted the ongoing misinformation being spread, often very loudly, by Rep. Brian Mast (R-FL 18th District). As evidenced in this article in the Okeechobee News this week, the facts often don’t match up with the Congressman’s incendiary rhetoric, and many rural residents are feeling left out of important decision-making processes that have big impact on their area. Mast has been a primary and very vocal advisor to Gov. Ron DeSantis on agriculture and environmental affairs throughout the election transition process. He has long been a loud critic of water management district officials and their handling of the lake’s water levels, which he says is causing algae blooms in his fast-growing urban neighborhood to the east. But the facts and the science often don’t agree with the Congressman’s opinions, no matter how loud and forceful his opinions are delivered. The entire South Florida Water Management board was forced to resign by the Governor’s office recently, regardless that they had been appointed for set terms by the previous Governor and approved for those appointments through the Legislative process. It was an action promoted heavily by Mast. It’s presumed by many to be an effort to stack a new Board with members more amenable to his views, regardless of what science says is really going on with lake waters and algae in some south Florida waterways. As more noise is made and more facts are ignored, more people in rural areas are becoming more concerned. Their vote numbers are slim compared to those in coastal areas that keep expanding rapidly with new developments. Many of those developments continue to install septic tanks in low lying areas as their waste systems of choice. Then people moving in from elsewhere wonder why there are water problems developing. Fed by the emotional rhetoric in their midst, the uninformed are easy to point blame elsewhere for problems created largely by the runoff in their own local neighborhoods. Agricultural people are pragmatic, logical, smart and very modest and proud. Sometimes it’s hard to track the source of some of their stories and sayings, but it’s often hard to ignore their logic. A good friend recently shared the observation that not too many years ago, there was about a million people in Florida and more than two-million head of cattle, and there were no water problems. Today there is around 21 million people in Florida, and about one million head of cattle, and water problems in urban areas abound. More than a third of Florida residents or so are on septic systems, and many areas being developed are, or were, low lying or swampy areas naturally. Agriculture and many of the rural farm and ranch families around Lake Okeechobee have proven over many years they know well how lake levels fluctuate and how they should be best managed to protect the best interests of the land, the people, the animals and the wildlife that the land supports. As time progresses, rural residents and farmers and ranchers in Florida are wondering who is listening to their input or their concerns these days. The vast majority of Florida’s approximately 21 million current residents came from somewhere else, including Congressman Mast who just moved to Florida around 2011 apparently – but now he claims to be expert at water management and Lake Okeechobee water science. Perhaps it would pay more dividends and solve more problems for all involved if those making the most noise got the facts straight, and followed science as a guide, rather than just turning up the volume on emotionally driven rhetoric that continues to be proven wrong time and time again.